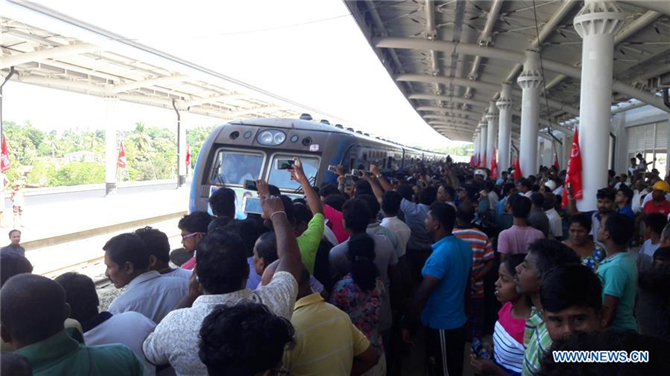 The Sri Lankan Ministry of Transporton on Sunday conducted a test run along the newly constructed railway line between Matara and Beliatta in the south of the island country which will boost passenger traffic. A major portion of the construction was carried out by China Railway Group 5 (CR5) and the Central Engineering Consultancy Bureau (CECB) which acted as the consultant. Sri Lanka's Minister of Transport and Civil Aviation Arjuna Ranatunga, speaking at a ceremony before conducting the test run, said that the railway line is the first to be constructed in Sri Lanka since 1948 and it includes the longest and second longest railway bridges of 1.5 km and 1.04 km, respectively. Ranatunga said he was hoping to officially inaugurate the railway line and open it to the public before the local Sinhala and Tamil New Year in April. The new railway line is expected to increase traffic into the south and boost trade between capital Colombo and the deep south.